Is Kroger's Rally Just Beginning? After Kroger reported mixed but favorable results for its first quarter, shares shot up! Is this a sign that the business' upside is only just beginning, or would the Foolish investor be better off with Costco? On June 19, shares of Kroger (NYSE:KR) shot up 5% to close at $49.66 after the company reported financial results for the first quarter of its 2014 fiscal year. With shares of the supermarket giant trading just 1% off their 52-week high, some investors might be pondering what steps to take next. Should the Foolish investor cash in and buy into Costco Wholesale (NASDAQ:COST), or does Kroger still present them with good long-term prospects? For the quarter, Kroger reported revenue of $32.96 billion. In addition to beating the $32.64 billion that analysts anticipated, the company's top line came in 10% above the $30 billion management reported for the same quarter last year. According to the company's press release, this jump in sales was due, in part, to a 4.6% increase in comparable-store sales in its supermarket operations but was also attributable to a 6.5% rise in the number of locations in operation. Although Kroger did well on a revenue basis, the company ended up falling short on earnings. For the quarter, the conglomerate reported earnings per share of $0.98. Fortunately, this represents a 6.5% increase over the $0.92 management reported for the first quarter of 2013, but it couldn't match the $1.05 that Mr. Market wanted to see. The reason for this shortfall appears to stem from its operating, general, and administrative expenses, which rose from 15.3% of sales to 15.7%. How does Kroger compare to Costco? 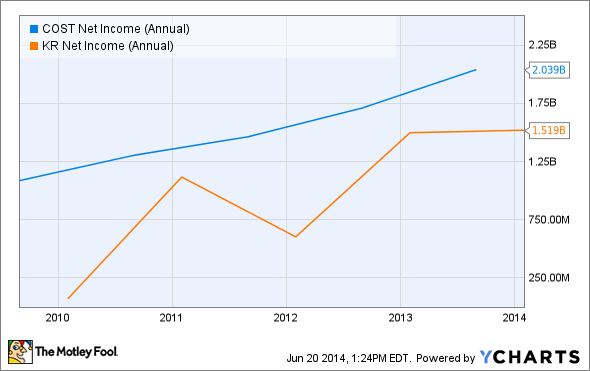 Over the past five years, Kroger has done pretty well for itself. Between 2009 and 2013, the retailer saw its revenue climb 28% from $76.7 billion to $98.4 billion. Out of this increase, just a small portion was attributable to a 3.5% increase in store count, while the rest appears to stem from improved comparable-store sales. During a similar five-year period, rival Costco left Kroger standing in the dust. 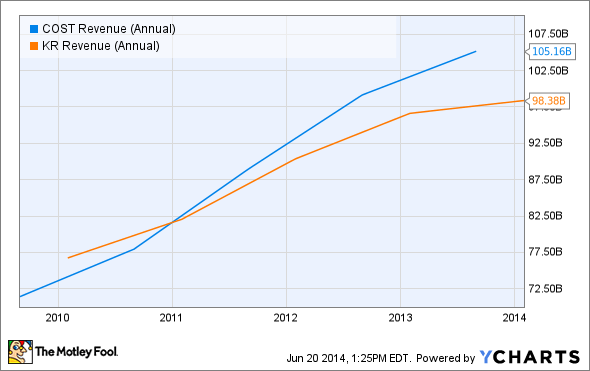 Between 2009 and 2013, the retail giant saw its revenue shoot up 47% from $71.4 billion to $105.2 billion. Unlike Kroger, Costco saw a nice 20% uptick in store count during this time frame, but the company also benefited from a 28% jump in aggregate comparable-store sales. From a profitability standpoint, Kroger grew even faster. Over the past five years, the retailer saw its net income shoot up 2,070% from $70 million to $1.5 billion. However, if you remove a $1.1 billion impairment management booked in 2009 and adjust for taxes using a 35% rate, the company's net income grew a more modest (but still very strong) 91% from $793.4 million to $1.5 billion. On top of the benefits coming from higher sales, Kroger also enjoyed some cost reductions, primarily from its selling, general, and administrative expenses, which dropped from 18.3% of sales to 16.1% and from its interest expense, which fell 12%. Despite its strong revenue growth, not even Costco has been able to keep up with Kroger when it comes to profits. During this five-year period, the big-box retailer saw its net income rise 88% from $1.1 billion to $2 billion. Just as in the case of Kroger, Costco enjoyed strong earnings growth because of its sales growth, but the company also saw some upside from its improved cost structure. This was mostly in the form of the retailer's selling, general, and administrative expenses, which dropped from 10.2% of sales to 9.7%, and its interest expense falling by 32%. As evidenced by its rising share price, Mr. Market appears to be very happy with Kroger, and justifiably so. Even though management could not match analyst expectations on the bottom line, they beat top-line forecasts, and the business itself is one that has had a pretty good run in recent years. Moving forward, it will be interesting to see if this trend can persist, but given the company's long-term performance, it would be hard to bet against the business. However, for those more focused on revenue growth as opposed to earnings growth, Costco would also make for an interesting prospect.